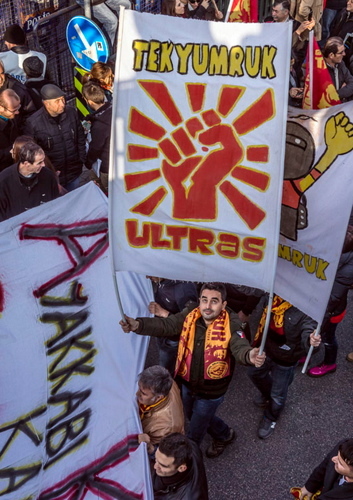 After weeks of preparations and permissions sought (and granted) from local municipalities, the day of the solidarity march was finally upon us. 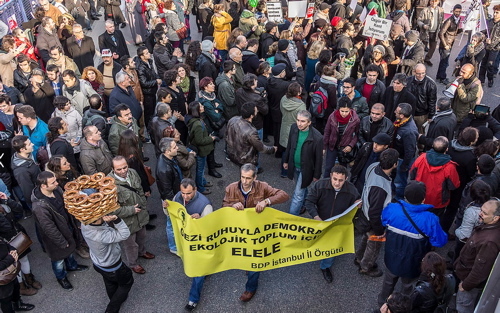 Yesterday (December 22) thousands of people came together in Kadıköy to protest the urban politics of the government. Environmentalists, archaeologists, historians, architects, ecologists, women’s movements, LGBT movements, human rights organisations and displaced communities came together to ‘reclaim their city’. 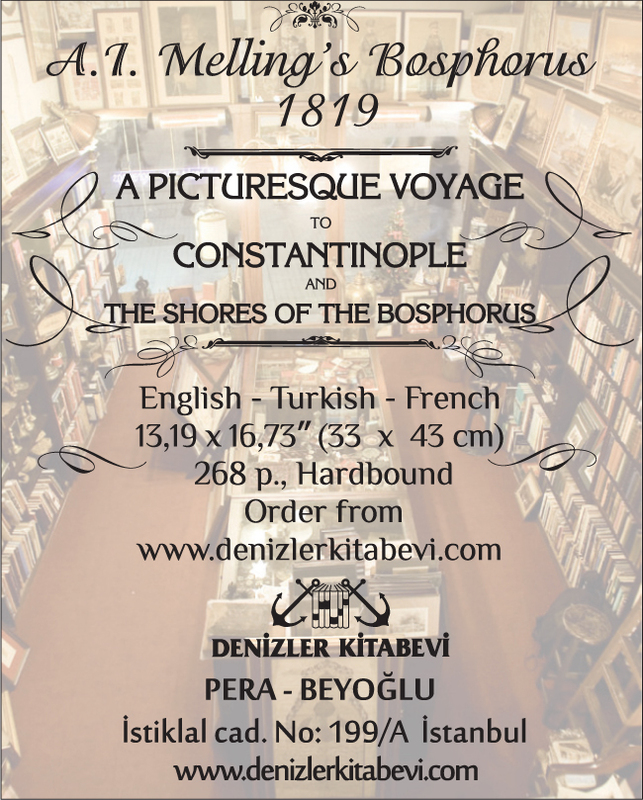 As mentioned elsewhere on this blog, the manifesto of the December 22 initiative is simple: to say NO to ‘those craving money and power who have commodified Istanbul and put its neighbourhoods, public squares, forests, history and culture on sale’. People started pouring into the streets at 12 noon. Armed with banners, most just displaying peace signs and equally peaceful messages (above top), they began their march – some quietly, some more vocally. 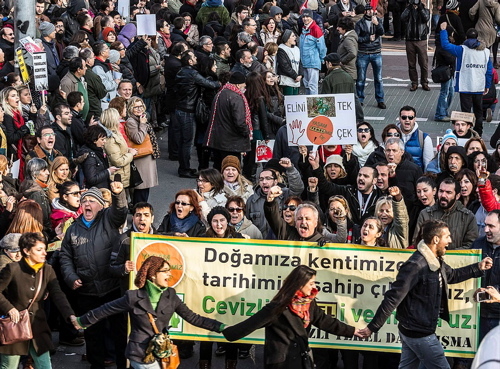 Photographer Murat Germen even captured a clever simit-seller going into the crowds to feed the hungry (above middle). 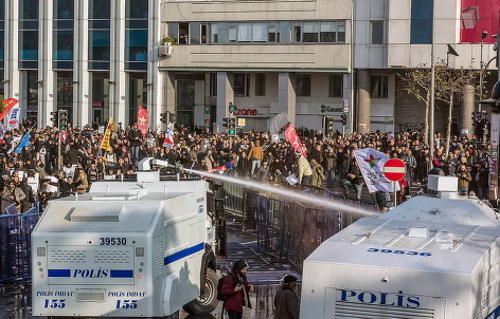 According to activist group, Istanbul Revolution, who was amidst the action, police started attacking participants from the get go with their weapons of choice: pepper gas and water canons. Here I was thinking the point of a protest in a democracy was to get your voice heard. Guess the police didn’t get that memo. 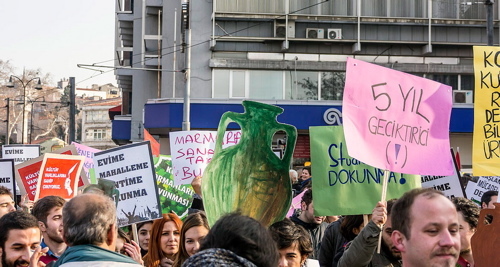 Some protesters turned up with shoe boxes filled with fake money and corresponding slogans (the above image shows one such banner, obstructed on the left, in which we can make out the word ‘ayakkabı’, meaning ‘shoe’) in the aftermath of the corruption and bribery allegations in which police seized $4.5-million in cash hidden in shoe boxes in Halkbank CEO Suleyman Aslan’s home. 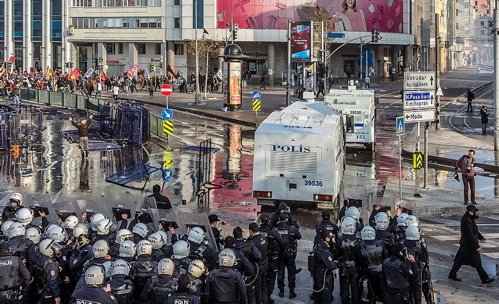 An issue close to the hearts of many protesters fed up with their government, it is being labelled as the worst scandal in Prime Minister Erdoğan’s 11-year rule and is posing serious questions for his political future. As the police attacks intensified, a handful of people began throwing stones begging the question: Were the protesters getting violent or do we have a couple of agent provocateurs on our hands? 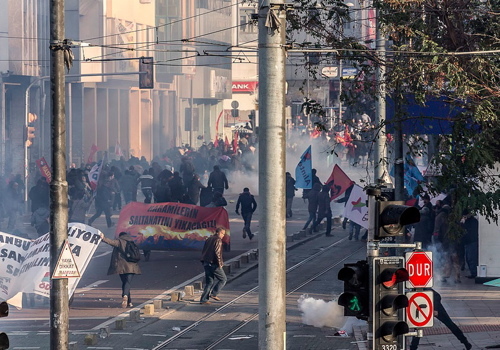 According to Cihan Baysal, spokesperson for Istanbul Urban Movements, one of the major proponents of the December 22 initiative, police not only attacked the alleged stone-throwers but also stewards, and there were also reports of divided ranks among the police. What started an optimistic, transparently innocent rally ended as usual in (gas-induced) tears. 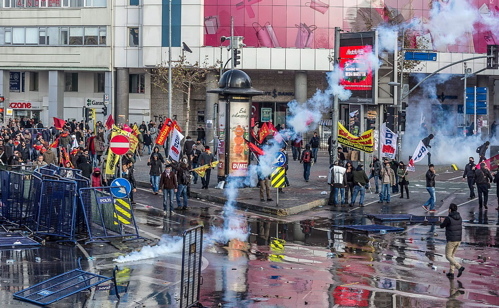 Independent Turkish news outlets report many injured and one person was shot in the eye with a plastic bullet. But the biggest tragedy was 64-year old Elif Çermik (above), who ended in a coma after her heart stopped as a result of the police violence. 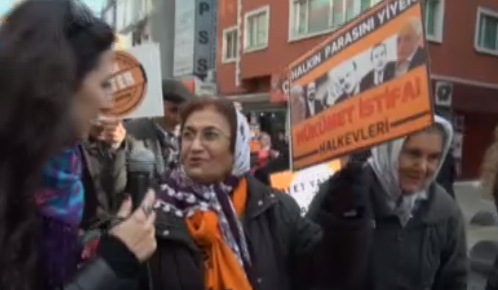 Answering the ÇapalTV journalist’s question about what she had wanted by taking part in the rally, Çermik replied, ‘We want a beautiful country.’ Our prayers are with her. 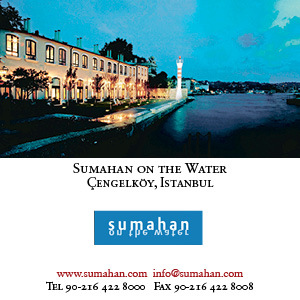 All images, except the last one, courtesy of Murat Germen (click here to see his Flicker page). Last image is a still from a video courtesy of capul.tv.